"Encouraging the appreciation and practice of the visual arts in this district"
In 1946 a group of seven artists met at a local school wishing to share skills and enthusiasms and organise joint art exhibitions. They went on to found Exmouth Art Group with the agreed aim “to encourage the appreciation and practice of the visual arts in this district”. Seventy years later with more than 200 members the Group keeps to this ambition. Since 1955, when several members knocked at their door asking for permission to sketch in the spectacular grounds, we have been privileged to have the unfailing support of the Lindsay-Fynn family. Today Nigel and Heleen Lindsay-Fynn are second generation Patrons and take a close interest in the Group’s well-being hosting a reception each year at Lee Ford, their home in Budleigh Salterton. Through generous sponsorship we are able to offer several awards. A substantial legacy left by Norah Pearse funds exhibition prizes at our major autumn event and Clifford & Sandy Lenn and Nick & Carol Williams donated the Channel View Cup to be awarded to the artist whose exhibit is voted visitors’ favourite. In recent years, two trophies have been inaugurated by retiring Presidents May Neilson and Colin Marshall. These are the Neilson Trophy for the 3D Best in Show in our major exhibition, and the Mayor’s Best in Show Trophy at the Exmouth Festival Exhibition. For competitions a Salver donated by Group member Paul Butler goes to the winner of Architecture and Landscape; a Cup bequeathed by the family of Neil Ashley for Monochrome Drawing and the Roger Matthews Cup presented to the winner at our Christmas party. 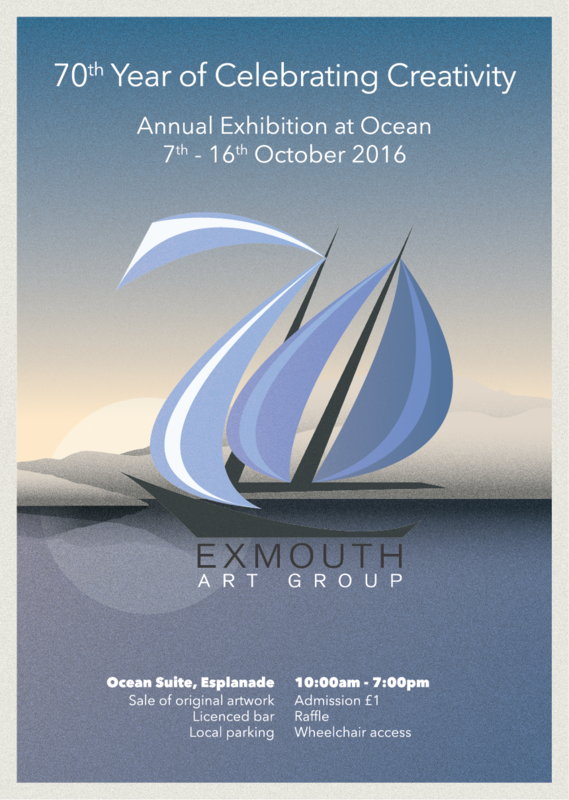 We celebrated our 70th Anniversary in 2016 and last year held our 72nd Annual Exhibition at Ocean on Exmouth seafront. The enthusiasm and enjoyment of both occasions reassures us that we are set to continue for at least another seventy years. Indeed the Group has an unbroken record of holding a major exhibition annually and at our 70th event we were delighted by the presence of our Guest of Honour Mary King MBE. 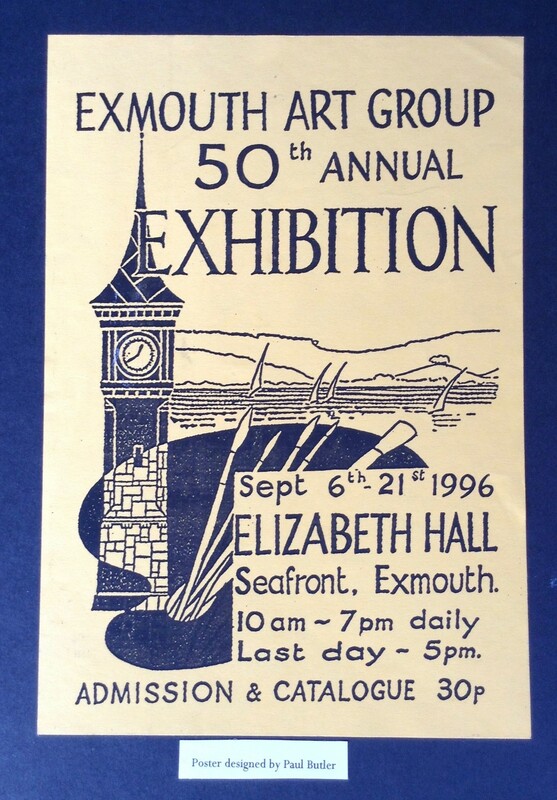 For many years our regular venue for the autumn show was the Elizabeth Hall, formerly on the site of the Premier Inn, then relocated to Exmouth Community College, and for just one year in the Owen Building on the then Rolle College campus. Our traditional location now, however, has become the second floor of Ocean on Exmouth seafront. Our Exhibition during the Exmouth Festival held for several years in the Council Chambers of the Town Hall relocated to the Kennaway Centre on Victoria Road, then for one year to Ocean on Exmouth seafront but for the first time last year we moved back to the original Elizabeth Hall location but this time with the support of Whitbread PLC we were able to use the facilities of the Premier Inn. Previously, we had a long association with the National Trust’s A la Ronde holding a Group exhibition there in the summer and individual members still put on own solo events in the tearooms at different times of the year. The collection of Archive images has been taken from an Album created by Muriel Johnson in 1996. She has been a long-standing member of the Group, joining in 1983 after being encouraged by the Annual Exhibition in 1982 at the old Church Institute Hall in Rolle Street. Muriel became the Group Secretary in 1985 and after five years as Secretary, three years as Vice President and then ultimately three years as President from 1994-97. The Art Group is grateful to Muriel for having taken time to create these records and we hope you will enjoy looking through some of the old images. Her content was collated using pages from the annual Exhibition catalogues, the members’ little Golden Jubilee Brochure (1946-1966), press cuttings and photographs from The Artist and Leisure Painter, Exmouth Journal, Express & Echo, Exmouth Herald. Photographs taken by David Binmore (Golden Jubilee Dinner), Muriel Johnson, Tom Reeves, Nigel Lyndsay-Fynn, Doreen Cutler and there are many members’ photos of their own paintings. We hope you will enjoy these few pages as you ‘Peep into our Past’. Please click on the links below to view these images.